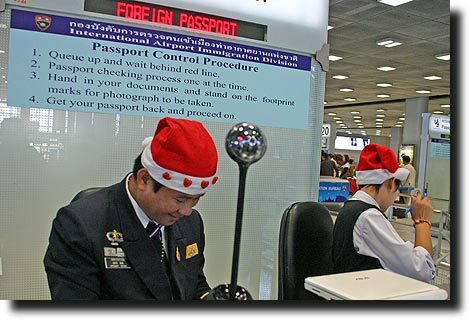 When we landed in Bangkok on our big winter vacation to Thailand, we weren't really too sure what to expect. The global economy was crashing, and there had just been a standoff between the government and opposition protesters that had closed all the airports for weeks, stranding hundreds of thousands of tourists. We certainly didn't want to get caught up in any of that! The immigration control officers, however, gave us the first impression that this was not business as usual. Bedecked in Santa hats, they were not the grim, unsmiling sort we usually meet - instead acting funny, chatting with the kids, and at ease with us taking a picture. This laid back attitude seemed everywhere in the city, as people seemed more content to go about their own business instead of trying to get into ours. Yes, there were pushy salesmen, but they were considerably less pushy than those we've met elsewhere (or else we're just getting better at ignoring them!). 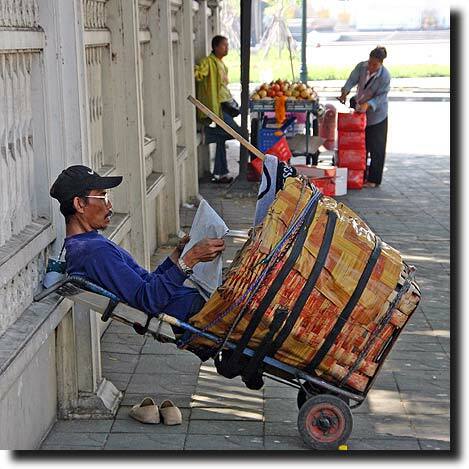 Most people seemed to recognize that there was a time to sit back, kick your shoes off, and read the newspaper while sitting in a big basket tied to a tilted dolly in the middle of a public sidewalk. From the ever-present temples, steeples, and shrines, the city's fascination with religion (or at least religious buildings) is an obvious fascination. We were able to spend a good amount of time exploring different abodes of the Buddha. 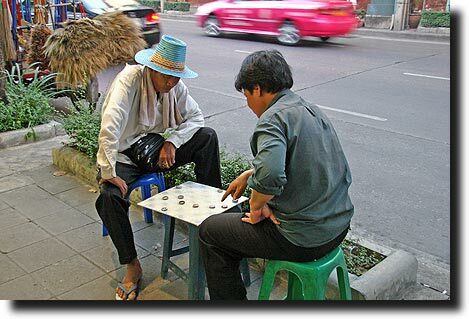 We also played a bit ourselves, just as these two who we passed nearly every day leaving our hotel. 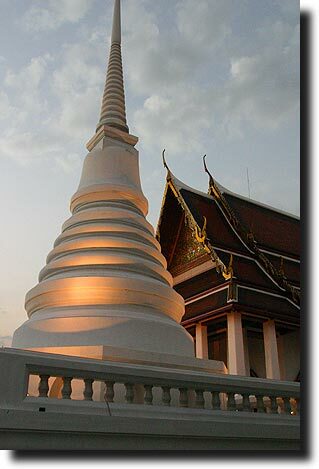 Come explore the richness of Bangkok with us!